Mickalene Thomas, Tamika sur une chaise longue avec Monet, 2012, Rhinestones, acrylic, oil, and enamel on wood panel, 108 x 144 in. Collection of Walda and Sydney Besthoff. NEW ORLEANS, LA.- Tulanes Newcomb Art Museum presents Mickalene Thomas: Waiting on Prime-Time Star. On view January 18 through April 9, the exhibition brings together more than 40 of the artists works including paintings, photographs, collages, sculptures, ﬁlm, and a site-speciﬁc installation that broadly engage the subject of portraiture. Mickalene Thomas (b.1971) is a USA Fellow and acclaimed international artist known for her elaborately lush works that celebrate the power of female beauty toward claiming women's agency. Thomas combines historical artworks and pop cultural representations that deﬁne and reference fashion and domestic spaces through a queer lens. Waiting on Prime-Time Star will also highlight Thomas creative process of working across different media, including photography, collage, painting, ﬁlm, and installation. Utilizing such myriad strategies, she challenges portraitures divide between representation and abstraction while also offering a vocabulary for re-deﬁning notions of femininity. The show opens on Wednesday, January 18 with two events that are free and open to the public. Starting at 6:30 pm, the artist will speak about her work in conversation with Dr. Mia Bagneris, Assistant Professor, History of Art, Tulane University. The talk will take place in the Woldenberg Art Centers Freeman Auditorium and is funded in part by the Sandra Garrard Memorial Fund for Recent Trends in Contemporary Art. The public reception will follow from 7:30 until 9:00 in the art center's Woodward Way Breezeway. 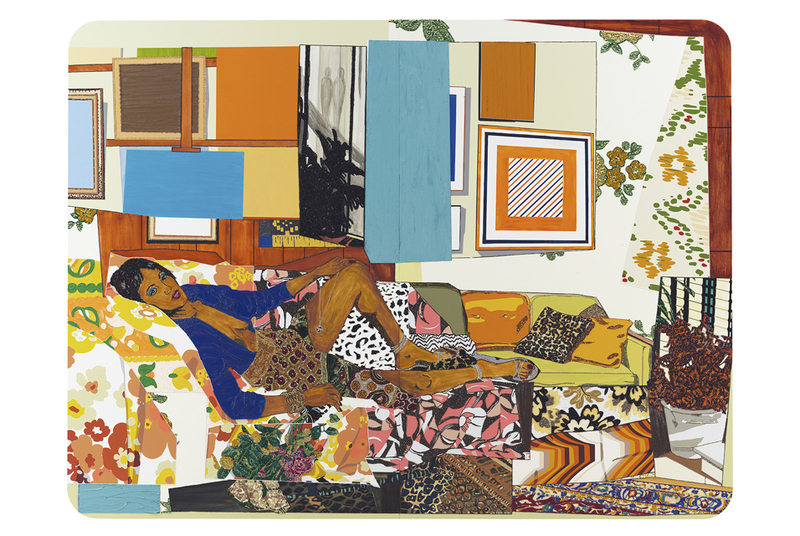 Mickalene Thomas is a 2015 United States Artists Francie Bishop Good & David Horvitz Fellow, a distinguished visual artist, ﬁlmmaker and curator who has exhibited extensively both nationally and internationally. She is known for paintings that combine art-historical, political, and pop-cultural references. Her work introduces complex notions of femininity and challenges common deﬁnitions of beauty and aesthetic representations of women. Thomas earned her MFA from Yale University in 2002, and a BFA from Pratt Institute in 2000. Her ﬁrst solo museum exhibition, Origin of the Universe, originated at the Santa Monica Museum of Art in 2012 before traveling to the Brooklyn Museum of Art, where her ﬁlm Happy Birthday to a Beautiful Woman premiered. Recent solo exhibitions include George Eastman House, New York; LEcole des Beaux Arts, Monaco; and First International Contemporary Art Biennial, Columbia. Her work has been shown in numerous group exhibitions, including at La Conservera Contemporary Art Center, Ceutí, Spain; Corcoran Gallery of Art, Washington, DC; Hara Museum, Tokyo; National Portrait Gallery, Washington, DC; Saatchi Gallery, London; and University Museum of Contemporary Art, University of Massachusetts, Amherst. Her work has been featured in various catalogues and reviewed by Artforum, Art in America, The New York Times, The New Yorker, NY Arts, Modern Painters, and The Wall Street Journal, among others. Thomas has participated in residency programs at the Studio Museum in Harlem (2002-2003) and the Versailles Foundation Munn Artists Program in Giverny, France (2011). Recent and upcoming commissions include Better Days, Galerie at Volkshaus, Basel, Switzerland (with Absolut Vodka Art Bureau); as well as mural projects for the Los Angeles County Metropolitan Transit Authority; Art in Embassies Program at the United States Embassy in Dakar, Senegal; and the Barclays Center, Brooklyn. Her ﬁlm Happy Birthday to a Beautiful Woman is currently featured on HBO and received the Black Star Film Festival Audience Awards-Favorite Short in 2013. Thomas has been honored by the Museum of the African Diaspora in San Francisco (2015), MoMA PS1 (2015), and BOMB Magazine, and has received a United States Artists Fellowship (2015), MoCADA Artistic Advocacy Award (2015), AICA-USA Best Show in a Commercial Space Nationally (2014), Anonymous Was A Woman Grant (2012), Brooklyn Museum Asher B. Durand Award (2012), Timerhi Award for Leadership in the Arts (2012), Joan Mitchell Grant (2009), Pratt Institute Alumni Achievement Award (2009), and Rema Hort Mann Grant (2007). Thomas work is in the permanent collections of New Yorks The Museum of Modern Art, Brooklyn Museum, Solomon R. Guggenheim Museum, and Whitney Museum of American Art, as well as the Detroit Institute of Arts, Hammer Museum, Nerman Museum of Contemporary Art, Seattle Art Museum, and Smithsonian American Art Museum, among many others. Mickalene Thomas is represented by Lehmann Maupin, New York and Hong Kong; Kavi Gupta Gallery, Chicago and Berlin; Susanne Vielmetter Los Angeles Projects; and Galerie Nathalie Obadia, Paris and Brussels. She lives and works in Brooklyn, New York, and serves on the board of the Brooklyn Museum, Childrens Museum of the Arts, MoCADA, MoMA PS1, and Rush Philanthropic. WeTransfer offers free premium accounts to every arts student in the U.S.